Will the adoption of CCMS push some school districts to lower standards for all students? Low-income students will also be hurt the most by the shift to weaker math standards. Since the Common Core math standards only end at a partial Algebra II course, nothing higher than Algebra II will be tested by federally funded assessments that are currently under development. High schools in low-income areas will be under the greatest fiscal pressure to eliminate under-subscribed electives like trigonometry, pre-calculus, and calculus. 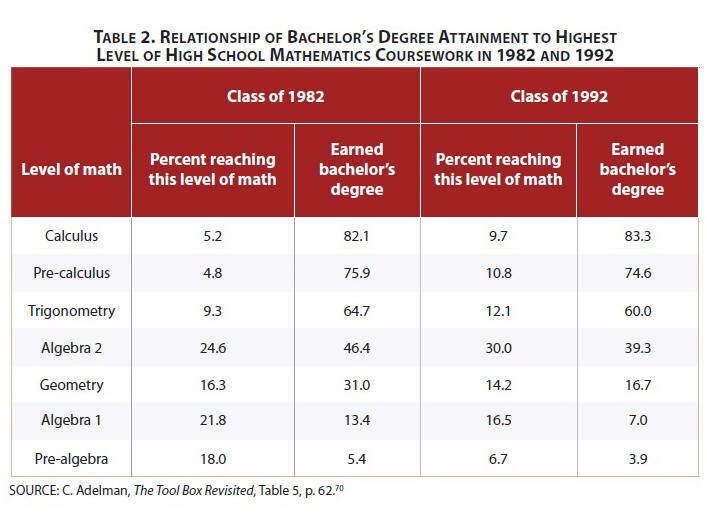 Research has shown that the highest-level math course taken in high school is the single best predictor of college success. Only 39 percent of the members of the class of 1992 who entered college having taken no farther than Algebra II earned a college degree. The authors estimate that the number will shrink to 31-33 percent for the class of 2012. “Common Core Math Will Reduce Enrollment in High-Level High School Courses”, Pioneer Institute, Sept. 8, 2014. Richard P. Phelps and R. James Milgram White, The Revenge Of K-12: How Common Core And The New SAT Lower College Standards In the U.S., Pioneer Institute, September 2014. New York endorses the vocational high school option with new graduation requirements. Earlier this week the “Board of Regents approved a plan for a “4+1″ option, which would allow students to pass an exam in career-and-technical education, the arts, a different math or science, or a language other than English in lieu of one of the history exams”. The new plan is called Pathways To Graduation. Proponents of the change say it would underscore the academic value of career training and because tests often drive what is taught, it would spur schools to expand vocational programs. Now, students need to pass five Regents exams: one each in math, English and science, and two in social studies. Under the proposal, students could choose to skip one of the social studies exams—either American history or global history—and take one in Career and Technical Education, or an extra science or math exam. If adopted Monday, the change would affect current seniors. The options could grow, but 13 proposed Career and Technical Education tests now include graphic arts, electronics, carpentry and hospitality management, and the exams would reflect several years of coursework. They are industry-certification tests such as the CompTIA A+, a test created by a consortium of information-technology companies. The expectation is for improved graduation rates, now at 75%. …The union, business leaders, and the commissioner are all supportive of the plan. Proponents deny that Pathways is just making it easier to graduate. State Education Commissioner John B. King Jr. said while many people assume vocational education has less rigor and fewer opportunities, career and technical-education courses have become more complex and demanding, and prepare students for fields with good pay. He said rather than diverting students from college, such routes often inspire them to pursue higher education, even if after a stint in the workplace. Final approval is expected in January, and changes could be implemented in time for this school year. Leslie Brody, “New York Prepares a New Exam to Boost Career Training”, Wall Street Journal, Oct. 19, 2014. Debra Viadero, “Vocational Pathways Approved for Graduation in New York State”, Education Week, Oct. 22, 2014. A trend in higher education away from “time served” to “stuff learned” could mean significant savings in both time and money for many college students. According to Inside Higher Ed, more than 350 institutions now offer or are seeking to create competency-based degrees. So it’s a safe bet that we’ll be hearing more about this trend soon…. The “Flexible Option” at the University of Wisconsin currently offers five competency-based degrees. It’s the first public institution to receive permission to offer this kind of program…. The Lumina Foundation has been one of the most influential nonprofit groups pushing the idea of competency-based education…. Lumina is about to release the final version of a document called the “Degree Qualifications Profile.” It aims to provide a common basis for understanding the competencies required for an associate’s, bachelor’s or master’s degree in any field. In its draft form, around 400 institutions from small liberal arts colleges to large community colleges have begun to use the document in their strategic planning. The University of Michigan is one of the latest to join the movement. Rigorous oversight will be essential to the success of this new way to grant degrees. Freed of the credit-hour constraint, competency-based programs need to be a lot more rigorous and transparent about designing assessments. Otherwise, they risk turning into diploma mills. Employers may find this change produces more competent workers. … The more schools have the freedom to grant degrees on the basis of proficiency rather than “time served,” the more relevant to the demands of today’s economy higher education will become. Anya Kamenetz, “Competency-Based Education: No More Semesters?”, NPR, October 07, 2014. Walter Russell Mead, ‘New Degrees Challenge “Time Served” Model’, The American Interest, October 25, 2014. Personal savings and income from work will become increasingly important to future retirees. Working in retirement is likely to become even more commonplace as Generation Xers and Millennials eventually head toward their retirement years. While many of today’s retirees say they can count on Social Security and employer pensions to fund most of their retirement, future generations are far more likely to say they will need to rely primarily on personal savings and income from working during retirement (FIG 8). 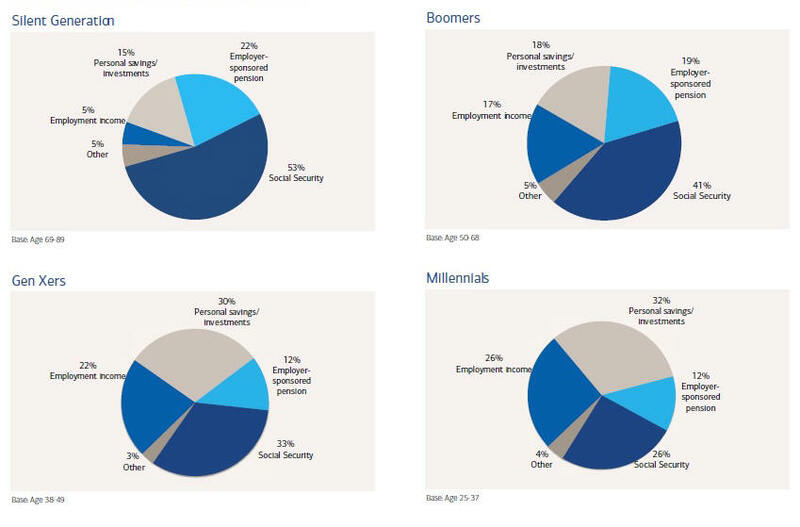 Although I was initially surprised that 12% of Gen Xers and Millenials still expect pensions to fund their retirement, I realized these might represent the views of government employees, one of the few groups still covered by traditional pension plans. And those who expect personal savings to cover retirement expenses need to start saving more. The latest alarming news on this topic is that “middle-class people in the USA have a median of $20,000 saved for retirement, far short of the $250,000 they think they’ll need during that time of their lives”. Work in Retirement: Myths and Motivations, Merrill Lynch with Age Wave, June 2014. 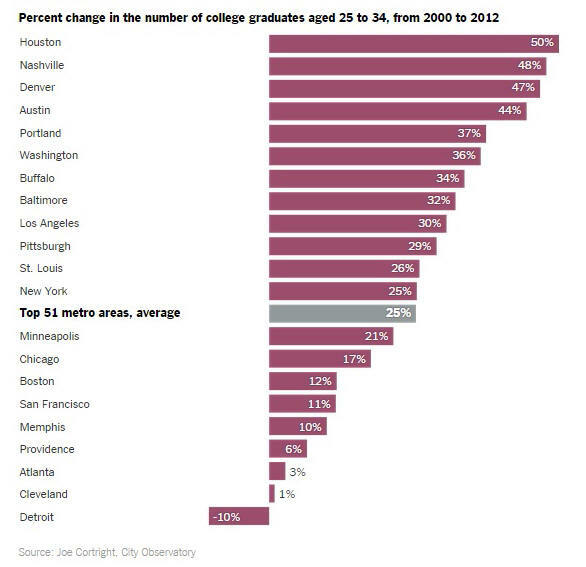 Where are young college graduates choosing to live? And as they age, will they flee to the suburbs as earlier generations have done? These trends bode well for the top cities. The economic effects reach beyond the work the young people do, according to Enrico Moretti, an economist at the University of California, Berkeley, and author of “The New Geography of Jobs.” For every college graduate who takes a job in an innovation industry, he found, five additional jobs are eventually created in that city, such as for waiters, carpenters, doctors, architects and teachers. “It’s a type of growth that feeds on itself — the more young workers you have, the more companies are interested in locating their operations in that area and the more young people are going to move there,” he said. Will millenials flee to suburbia as they start to have families? How many eventually desert the city centers as they age remains to be seen, but demographers predict that many will stay. They say that could not only bolster city economies, but also lead to decreases in crime and improvements in public schools. If the trends continue, places like Pittsburgh and Buffalo could develop a new reputation — as role models for resurgence. Not so fast. According to New Geography, “the first group of millennials who are now entering their 30s … are beginning, like preceding generations, to move to the suburbs”. Here’s how the geography of aging works. People are most likely to move to the core cities in their early 20s, but this migration peters out as people enter the end of that often tumultuous decade. By their 30s, they move increasingly to the suburbs, as well as outside the major metropolitan areas (the 52 metropolitan areas with a population over 1,000,000 in 2010). This pattern breaks with the conventional wisdom but dovetails with research conducted by Frank Magid and Associates that finds that millennials prefer suburbs long-term as “their ideal place to live” by a margin of 2 to 1 over cities. Based on past patterns, by the time people enter their 50s, the entire gain to the core cities that builds up in the 20s all but dissipates, as more people move to suburbs and to outside the largest metropolitan areas. Claire Cain Miller, “Where Young College Graduates Are Choosing to Live”, New York Times, October 20, 2014. Joel Kotkin, “The Geography of Aging: Why Millenials are Headed to the Suburbs”, NewGeography.com, December 9, 2013. The mysterious skill of “critical thinking” — schools try to teach it and employers seek workers who have it. But the definition is hard to pin down. I like the first definition the best, but of course employers define it any way that makes sense for their workplace. In any case, it has become an increasingly sought-after skill. Mentions of critical thinking in job postings have doubled since 2009, according to an analysis by career-search site Indeed.com. The site, which combs job ads from several sources, found last week that more than 21,000 health-care and 6,700 management postings contained some reference to the skill. A concrete example of what critical thinking means in the workplace comes from NYU music business graduate Brittany Holloway. Ms. Holloway, 21 years old, says her current job requires her to think critically when screening music releases before they’re sent to digital stores like Apple Inc.’s iTunes. Critical thinking and problem solving skills are related, and employers report they are having difficulty finding college graduates that measure up in those areas. Colleges, having “institutionally supported and encouraged [a] retreat from academic standards and rigor”, are regularly chastised for failing to teach those skills. A broad base of knowledge is needed before we can become critical thinkers. Will Common Core Standards help develop critical thinking skills? Part of the problem is a decline in content-based instruction that affects students from kindergarten to college. Common Core Standards, with their emphasis on non-fiction reading and evidence-based writing, may remedy that. But that is still to be determined, partly due to the ongoing implementation problems of CCS. Melissa Korn, “Bosses Seek ‘Critical Thinking,’ but What Is That?”, Wall Street Journal, Oct. 21, 2014. The vast majority of teachers refuse to give up the myth of learning styles and other fallacies about how the brain operates, even though these beliefs hurt students. The idea that we only use 10 percent of our brains has been roundly debunked — but, according to Paul Howard-Jones, an associate professor of neuroscience and education, teachers don’t necessarily know that. In an article in Nature Reviews Neuroscience, he reveals the disturbing prevalence of this and other “neuromyths” in classrooms around the world, and explains why they can be so damaging. A few years ago one of my children filled out a learning styles questionnaire at school, presumably so that the teacher could tailor instruction in the classroom. I suspect these myths are still being taught in college education courses. Daniel Willingham explains that “Learning Styles Don’t Exist”. Anna North, “How Brain Myths Could Hurt Kids”, New YOrk Times, October 20, 2014. You probably need a college degree to get hired as a secretary. Only college graduates need apply for secretarial jobs. More than half of employers now require a college credential for all jobs, and nearly one-third now hire college graduates for jobs that previously went to high-school graduates, according to a 2013 CareerBuilder survey of 2,600 hiring managers. Labor-market analytics firm Burning Glass Technologies recently found that 65% of postings for executive secretaries and assistants call for bachelor’s degrees, but just 19% of current secretaries have such credentials. I recently heard about a long-time secretary who had been laid off and could not find another job because she did not have a college degree. But a degree doesn’t necessarily make a candidate more qualified, it’s often just a way to screen applicants. Few hiring managers say that college graduates are more qualified than nongrads for jobs in retail and warehouses, but as long as the job market is tight, employers say they can afford to be picky. No wonder “parents push their kids to go to college”. Melissa Korn, “A Bit of College Can Be Worse Than None at All”, Wall Street Journal, Oct. 13, 2014. Posted in higher education bubble, jobs after college, value of college | Comments Off on You probably need a college degree to get hired as a secretary.